Cinderella stamps are another vast category of the field of Philately. There are probably millions of them around the World, and none of them appear in catalogs. With the advent of Google Search and Wikipedia, it has been possible to research many of them, but it is still a daunting task. A few days ago, I received a web inquiry from one of my site visitors from Louisiana. Here's the context of his inquiry. information online about them. I realize they were not real postage stamps. Have you ever heard of them. I remember them being blue in color. Sure appreciate your time. Having never heard of Cinderella stamps of this type, I speculated that these stamps may be some kind of commercial trading stamps. Over the last few days, my site visitor and myself have researched this topic with intensity. 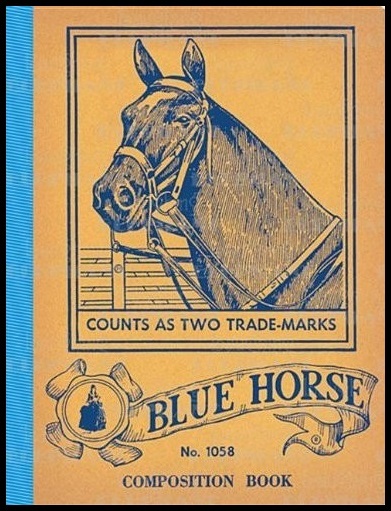 The information we found is the basis for this website article ... A Tale of a Blue Horse. 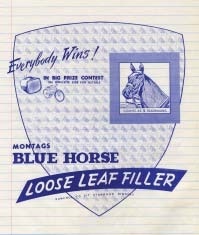 The Blue Horse was the logo of Atlanta-based Montag Brothers Paper Company. 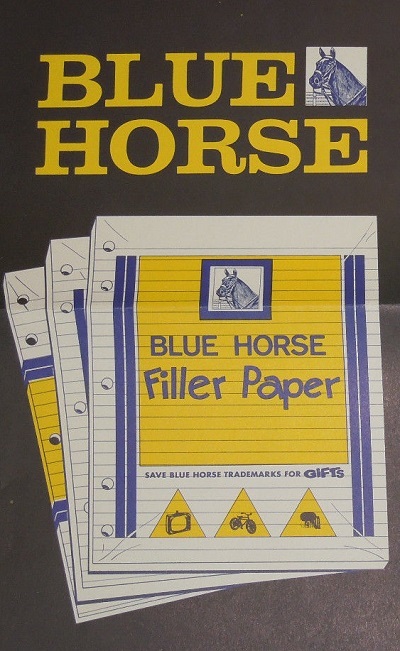 They began their business during the Great Depression, and at one time, they were the largest paper products company in the United States, specializing in office and school supplies. They went through a series of mergers in 1960's, and eventually they were taken over by the Mead Corporation of Dayton, Ohio. The corporation quickly found its niche with the younger scholastic crowd by launching a clever awards marketing promotion. 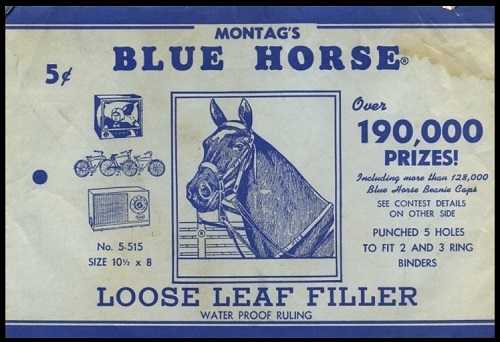 Each product was enclosed in a small wrapper with the familiar Blue Horse head icon in the middle. These trademarks were then clipped, saved, and redeemed for prizes. of loose leaf filler paper. Products costing 5 cents counted as one trademark, and products costing 10 cents yielded two trademarks. Participants were instructed to fasten the clippings in bundles of 50 or 100 before mailing them. Students sending in 20 Blue Horse heads received a souvenir beanie cap containing the company logo. All the other prizes required a minimum of 30 head trademarks. Each awards campaign lasted one year, with the deadline being June 15 of each year. radios, 550 footballs, 550 zipper notebook cases, 1,250 surprise awards, 20,000 bonus prizes, and 26,850 other prizes were given away each year, bringing the total to 50,000 prizes per year. Schools were also awarded. Cash donations were given to 167 schools each year, whose students had sent in the most Horse Head trademarks. In philately, "Cinderella stamp" is the term for anything resembling a postage stamp that is not issued by any government for the prepayment of postage. There are literally millions of types and varieties of these "stamps" spanning every country in the World. Some are Christmas seals, Easter seals, poster stamps, propaganda stamps, local stamps, and purely decorative stamps created for souvenir or advertising purposes. 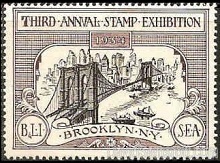 The Cinderella stamps shown above are for the 1964 New York World's Fair and a Brooklyn Philatelic Exhibition. A poster stamp is an advertising label, about the size of a postage stamp, that originated during the 19th Century. Their use declined after World War II, when their purpose was replaced by other types of print media. Today however, they have become very popular among collectors of Cinderella stamps. 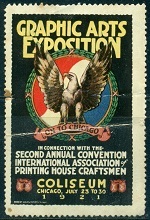 Poster stamps for a 1921 Graphic Arts Exposition and the 1933 Chicago World's Fair are shown above. Trading stamps were popular from the late 1800’s until the 1970’s. 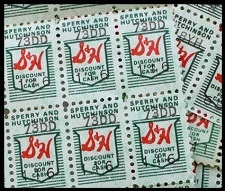 Grocery stores, gas stations, and other retailers used to give away quantities of trading stamps, usually sponsored by large retail firms, depending on the amount of purchase. One of the most popular, S&H Green Stamps, is shown above. The customer pasted them into redemption booklets, and when the booklets were full, they could be exchanged for commercial products through a catalog or at redemption stores. Today, the booklets of un-redeemed stamps are probably worth more as collectibles than they were for their commercial redemption value at the time they were distributed. In modern times, these promotions have been replaced by "points" credit cards and store "preferred customer" cards. For people that collect modern Germany or Austria stamps, this is a very familiar term. Literally, it means "memorial sheets". Many major philatelic exhibitions sell commemorative souvenir items to visitors. As they are not sold to the general public, these souvenir items can become very scarce. They have no postal franking value, but they are avidly collected by philatelists. 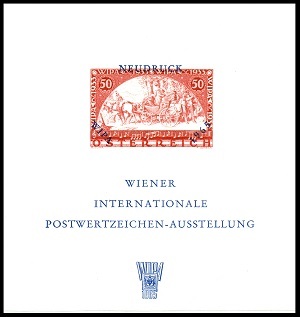 The sheet shown above was created for a 1965 Philatelic Exposition in Vienna. In "American" philatelic terminology, these souvenir items are known as "show sheets" or "souvenir cards".